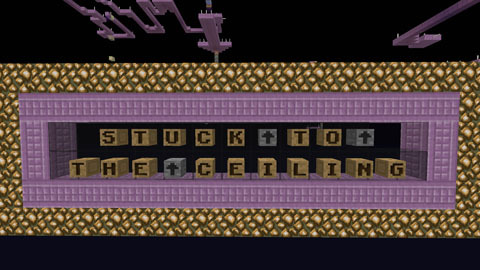 Don’t float upwards in this easy-to-challenging stay-under-the-blocks singleplayer Minecraft levitation map. Go through 9 levels (not including the training level at the beginning) of staying underneath the path way while floating upwards. Get off the pathway? You float upwards to your death! Run out of levitation? You float downwards to your death! So, basically, stay in the middle. 9 levels of pure awesomeness! Go under END STONE BRICK BLOCKS to teleport 8 blocks downward. Go under PACKED ICE to remove the levitation effect at the end of levels or at checkpoints. 2 sprint levels – You must sprint into the level and not let go of forward (or else you’ll stop sprinting). This map is singleplayer only.